BREAKING: ARJUN TURNS VILLAIN FOR HIS 'SISHYAN'? Irumbu Thirai directed by debutant Mithran PS stars Vishal and Samantha in the lead role. Yuvan Shankar Raja is the man in charge of the music department while Ruben handles the cuts and George C Williams takes care of the cinematography for this film produced by Vishal Film Factory. Arya was initially supposed to play the lead antagonist of Irumbu Thirai, but the ‘Raja Rani’ actor backed out of the project due to undisclosed reasons. 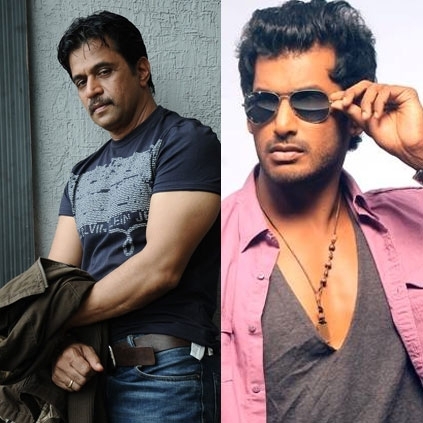 Our sources close to the camp have now hinted that the makers are in talks to rope in ‘Action King’ Arjun to play Vishal’s baddie. It is interesting to recall that Vishal had once worked as Arjun’s assistant in a film titled Vedham (2001). Now, will Arjun turn villain for his 'sishyan' (student)? Who is going to be Vishnu Vishal's heroine? Theri had 200, Kabali had 400, Si3 will have? A Valentine’s Day gift from Maniratnam-AR Rahman combo! Breaking: Sivakarthikeyan-Nayanthara film gets a Rajinikanth title? What’s brewing in Ajith’s Vivegam camp? People looking for online information on Arjun, Arya, Vishal will find this news story useful.